The upfront costs of vacations are predictable. It’s the little things—airport snacks, cocktails before dinner, tipping a tour guide—that can throw even the most well-planned vacation budget off track. In new series, we look at the spending patterns of real travelers in popular destinations, so you can estimate what you’ll actually spend. In this installment, two friends fly into Vegas and drive for three days from Nevada to Utah to Arizona. Antelope Canyon Tours: $78 (per person) for the most popular tour time. 11:00 a.m. 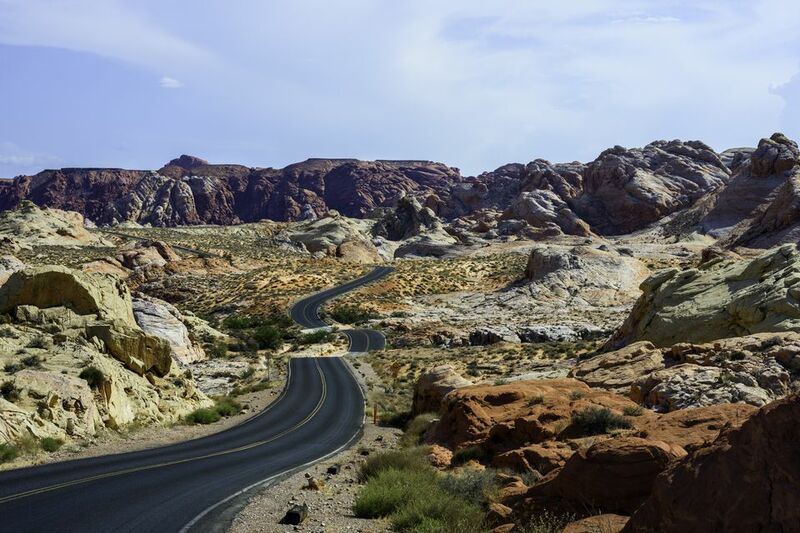 The drive from Las Vegas to Utah is filled with gorgeous scenery. Driving out of the most over-the-top city in the U.S. and immediately being surrounded by miles of desert is a bit surreal. How can a bright, showy city exist smack in the middle of all this? This, mainly being the stunning purple mountains in the distance, getting ever closer as we drive past cactus after desert brush. Of course, as we approach the mountains, we realize they aren't actually purple, but a red-brown color. As we set off on the trail, I'm a little disappointed. The trail itself is a paved path. I grew up in the Adirondack Mountains of New York, so I can't believe that a hiking trail is paved. Yes, the hike is steep, and yes, many parts of the trail wind around a cliff side with a sheer drop-off, but the path itself is steady, so no real need for worry. That is, until we reach the top. Oh, so this is what everyone was talking about. The end of the path greets us with a narrow ridge and a chain to hold onto so you don't fall over the edge. I take a few steps and decide I'm not cut out for this kind of hiking today. I let my friend tackle the rest of the climb, and I sit down with the rest of those who decided not to do it. 9:15 a.m. We had no idea what was in store for us, but we're now winding through narrow, cliffside roads. We make our way up, up, and up, all the while, gorgeous textured mountains are taking over our entire view. It's simultaneously beautiful and terrifying—one side of the road is a sheer drop-off, and as we get higher, the drop-off gets deeper. The mountain fairytale ends with a mile-long drive through a dark tunnel, straight into the belly of a mountain. 12:30 p.m. Our scheduled tour for Antelope Canyon is at 12:30, which was the recommended tour, as the light is optimal during this time of day in the Upper Canyon. We take a bumpy, somewhat thrilling ride on an off-road path into the desert to arrive at the entrance to the canyon. The path is tight, and some parts require being squished up against the canyon wall as other tour groups make their way by in the opposite direction. Our guide seems to have the most uncanny ability to locate the best photos. “Here, give me your phone,” and after bending into an awkward position against the canyon wall to capture the perfect shot, the results were truly unbelievable. The guides have also named many parts of the canyon, as if the wind and waters had magically formed presidential faces overtime; we can see Obama, Bush, Trump, and Lincoln–the resemblance is actually pretty spot-on for some of these. 4:30 p.m. Barely five minutes out of Page, we're immediately driving by Horseshoe Bend, and we decide to stop for a spontaneous exploration. We climb up and over a massive sandy hill, and we can spot the indistinguishable landmark. The colors are so vibrant this time of day, and the water bending around the rock is perfectly still. The breathtaking and slightly unexpected view makes Horseshoe Bend one of our favorite stops so far. We're back in the car, and on our way to Flagstaff, Arizona, and the landscape around us is slowly changing again. The flat-top mountains are gone, being replaced by trees (how long has it been since we’ve seen those?) and one gorgeous blue, snowy peak getting closer in the distance. The mountain is located near Flagstaff and a popular skiing destination. 6:30 p.m. Reaching Flagstaff, we come upon a quaint and cool little town. It's an eclectic mix of old Southern-style architecture, artful graffiti, and neon signs—a hipster-millennial playground. Our hotel—Monte Vista—is apparently infamous for being haunted. Since the 1920s, quite a few people have died there, and ghosts are apparently rampant throughout the hotel. 10:00 a.m. The drive to the Grand Canyon is a bit of a longer one (about three hours), and we decide to veer off the main highways for the Arizona backroads. The sun is out in full force, and the landscape, yet again, is amazing. Bright green brush and strange-but-pretty cacti occupy the desert while red and purple mountains stand tall in the distance. The closer we get, the more I'm wondering where the Grand Canyon could possibly fit into all of this. The zipline is brand new (opened January 2018), and the view, as anyone can imagine, is breathtaking. The actual thrills only lasted two lines and 20 minutes tops, which was a bit of a disappointment. We're in our RV on our way back to the shuttle stop, but our driver decides to pull over at the edge of the cliff to show us Quartermaster Canyon. Closed off to the public, and once the scene of a historic expedition, it is hard not to feel a bit unworthy standing on such sacred ground and taking in the unbelievable view. 3:15 p.m. There are two more shuttle stops and two different spots to view the Grand Canyon. The second stop on the line is slightly disappointing. After being wowed by Zion, Antelope, Horseshoe Bend, and Quartermaster, the canyon we are staring at now felt a little less grand. The third shuttle stop, however, immediately stops those complaints. It turns out the Grand Canyon is most definitely worth the hype. We're on a massive rock with miles and miles of canyon stretched out before us on three sides. On one side, there is an old abandoned guano mine that makes this scene that much cooler.